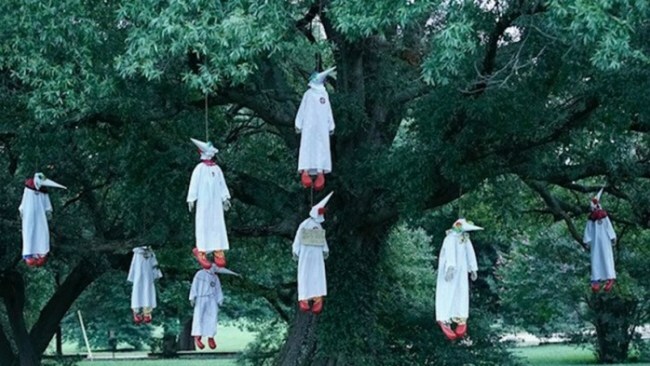 (The Grio) An anonymous group calling it self “Indecline” stirred up controversy in Richmond, Va this week after they hung eight figures dressed up as clowns and wearing Ku Klux Klan garb from a tree. The group said that they have been planning the act since the spring of 2016 and that they picked the location in Richmond, Virginia, because it was once the capital of the Confederate States of America. They also specifically chose to hang the figures overnight on Wednesday at Joseph Bryan Park because it was the location of Gabriel Prosser’s slave rebellion in 1800. The park has been closed, and police are considering it a crime scene.